The wooden vertical shaft (right) is the arm of the pendulum that maintains the time. The brass wheel at the top of the pendulum is used to adjust accuracy of the clock by changing the length of the pendulum. 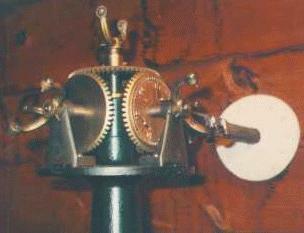 This device on top of the clock engine is used to set the time. 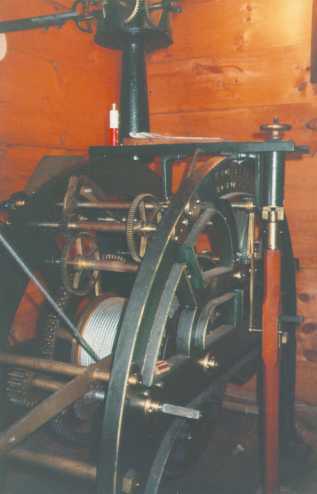 The horizontal shaft drives the hands on the clock. Weights, suspended a wooden chase, power the hammer that strikes the bell each hour. They are raised by winding the cable seen in the view of the clock innards (silver area in center of photo). A second set of weights powers the clock.